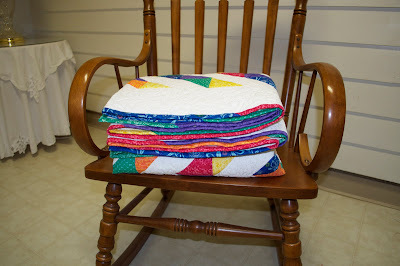 PBJ Quilt Sandwiches: Blogger's Quilt Festival! As I was cruising some of my favorite quilt blogs, I noticed everyone had a little button for this Blogger's Quilt Festival. I thought, "hmmmm - I need to click this and find out why everyone has this button!!!" I'm so glad I did! I think Blogger's Quilt Festival is a fabulous idea and I'm excited to share my Bejeweled Quilt for the occassion! I have only been sewing for a little over a year. This quilt was number 15 for me out of 26 for the year. I've quickly become obessed with sewing and just love learning new skills on each quilt top I make! This quilt was stippled in all the white, ditch-stitch around all the color, and bound with scraps of all the colored fat quarters I used. Sewing skill - I thought a diamond bullseye would be a neat way to try out half-square triangles! I really learned this skill because this had over 500 triangles to piece!!! 26 in one year. Impressive. 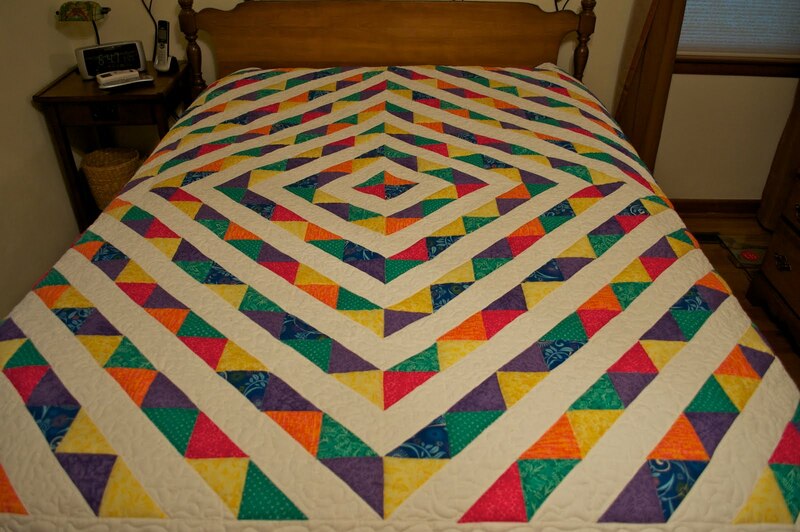 Your quilt is lovely and a great way to learn triangles. What a wonderful quilt! Pretty colors and great design. This is a fun quilt. Wow 26 in one year. Wish I had that kind of willpower to finish so many. Whew! You do inspire me! This one is gorgeous! Did you do free motion quilting? this is a wonderful quilt! the colors are great but the layout is just fantastic. i love this. thanks so much for sharing. i'm impressed with your sewing skills in such a short period of time. come visit my little blog http://fligamapoof.blogspot.com/ i'm having a giveaway this week.